After World War II, Alan Chadwick returned to England and went back into the theater, but the stay was brief. Escaping the memories of war, he moved to South Africa. In Cape Town in about 1950 Alan joined a newly formed theater troupe, The National Theatre Organization, and began touring and putting on plays. Chadwick disliked the touring, and couldn’t stand apartheid, so he resigned. In about 1952 another gardening opportunity presented itself, at the British Admiralty House in Simon’s Town on the Cape. British Vice Admiral Peveril William-Powlett hired Alan Chadwick to create renovated gardens at the Admiralty House. About this time, in the 1950s, Alan’s life would change forever, as he met his future best friend, confidant and muse, who would remain so for the rest of his life, Freya von Moltke. Alan later told journalist Bernard Taper of this time in his life. He spent much time with Freya and her two young sons, who had narrowly escaped from Germany to South Africa at the end of the war. 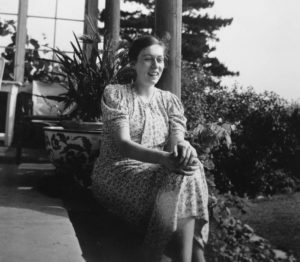 Both Freya von Moltke and Alan Chadwick felt that the youth of the newer generation could be directed into practical, peaceful spiritual pursuits – such as gardening – to possibly prevent more war. Alan, always restless, left South Africa for the Bahamas where he did some estate gardening, and then in the early 1960s, he moved to Long Island, New York, where he worked as an estate gardener. The momentous gathering of people and events that would change Alan Chadwick’s entire direction in life lay just ahead, in Santa Cruz, California. He was always a loner and a recluse, and began looking to relocate, possibly to Australia or New Zealand.